Hugh McElvaney being secretly filmed as part of an RTÉ Investigates broadcast in 2015. A STANDARDS IN Public Office [SIPO] hearing into an alleged breach of conduct by Monaghan County Councillor Hugh McElvaney has been adjourned for four weeks. An investigation into McElvaney’s alleged breach of the ethics of public office began at a SIPO commission this morning. It came following a complaint by Monaghan County Council over his actions in a broadcast of RTÉ’s Prime Time Investigates in 2015. He is the third person to be called before the commission in relation to the programme, following appearances by Sligo councillor Joe Queenan and Donegal councillor John O’Donnell last week. The complaint was made by the council’s chief executive after McElvaney was recorded discussing a prospective payment with an undercover reporter, who claimed to be working on behalf of a fictitious international company. The reporter, known only by the alias ‘Nina Carlsson’, purported to be seeking support to acquire land on which to construct a windfarm. 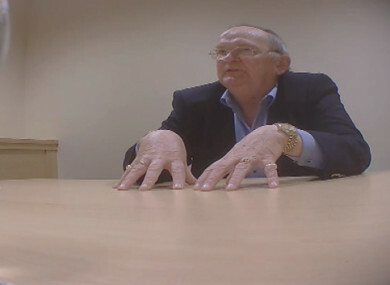 In audio and video recordings, McElvaney is heard agreeing with ‘Carlsson’ to be a conduit for the company, and telling her that “ten grand would be a start” and “I want loads of money”. ‘Carlsson’ also told McElvaney that their meeting would be kept private, and that he should not disclose that he had met her on planning matters. No details of a financial arrangement between ‘Carlsson’ and McElvaney was agreed, and the councillor denies any wrongdoing. He later acknowledged that an annual declaration of interests to the council for the year 2014, signed by him on 12 February 2015, was incomplete. In his opening submission as part of preliminary applications into the hearing, James Doherty SC for SIPO said that the commission was investigating four alleged breaches of public office by the councillor. However counsel for McElvaney, Breffni Gordon BL, said the investigation had “serious reputational issues” for the councillor, and asked why the commission was not calling ‘Carlsson’ as a witness. He said that McElvaney, who had “represented his country…[with] an unblemished record”, was entitled to a right to fair procedure, transparency, and to face his accuser in front of the commission. This included a right to vindication from the claims made by the “blonde, no doubt attractive lady” who had entrapped him in a way that he said was “unacceptable, if not illegal”. Gordon claimed there was a “world of difference” between the case and criminal entrapment. He used the hypothetical example of a police sting against a person who was seen dealing drugs, saying such undercover operations were launched to facilitate “a crime that was already going to be committed”. “It is clear that what unfolded was that ‘Ms Carlsson’ indicated to my client that he could trust her,” Gordon said. Gordon also claimed that video footage broadcast as part of the Prime Time Investigates programme on 17 December 2015, which formed the basis of the complaint, had a particular spin and only amounted to ‘hearsay’ evidence. He said there could be “no credible investigation” because the Commission did not know about the brief given to ‘Carlsson’ ahead of the recordings. Responding on behalf of SIPO, Doherty said that the defence’s demand to have ‘Carlsson’ brought before the commission was a fundamental misunderstanding of its duties. He claimed that the functions of the commission could not be compared to a court of law as Gordon suggested. “This is not a criminal trial, this is not a fitness to practice hearing; this is an investigation,” he said. Doherty dismissed claims that the recorded footage had been edited or spun in a particular way, saying it formed the fundamental basis of the complaint against the councillor. He asked the commission to consider an interview by McElvaney with local radio station Northern Sound, in which the councillor said he knew he was being set up by RTÉ and played along. Doherty said that the interview was a record of McElvaney’s public stance, and argued that claims of entrapment or misleading information could therefore not be considered. He said that the complaint from the council’s chief executive that initiated the investigation was not reliant on evidence from witnesses, but rather the video and audio recordings featured in the Prime Time Investigates broadcast. Mr Justice O’Keeffe ruled that it was therefore a matter for the commission to consider whether that evidence was sufficient, particularly whether it could be used to sustain any findings against McElvaney. He also said that ‘Carlsson’ was not McElvaney’s accuser, as Gordon suggested, because neither she nor RTÉ were a party to investigation. “[The] ‘accusers’ in this case are the chief executive and the cathaoirleach of Monaghan County Council,” the ruling said. He therefore rejected preliminary applications on behalf of McElvaney and allowed the hearing to proceed. Responding on behalf of McElvaney, Breffni Gordon BL sought to make a High Court application to seek legal clarity on the evidence being used against his client. Gordon claimed that the broadcast had allowed McElvaney to be “held up in front of the public and effectively skewered”, and that as the recordings would be played for the commission, media reports on the hearing would lead to further ridicule. “There is serious integrity issues at stake and public issues at stake,” he said. He argued that because the evidence in question dated back to 2015, there was no urgency in continuing the hearing until a High Court application had been made. Gordon also said that he had received instruction from McElvaney to inform the commission that he would not partake in the hearing if the application could not be made. “Regrettably I find myself in a position where I ask this commission, in light of your ruling, to take no evidence at the hearing,” he said. Asked how long it would take to make the application to the High Court, counsel for McElvaney replied “within a number of days”. After breaking to consider the matter, Mr Justice O’Keeffe adjourned the hearing for four weeks to allow McElvaney to bring an application on the evidence to the High Court. Email “Investigation into councillor who asked for 'loads of money' won't hear from undercover RTÉ reporter”. Feedback on “Investigation into councillor who asked for 'loads of money' won't hear from undercover RTÉ reporter”.